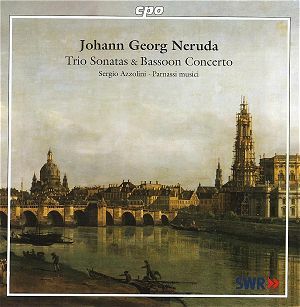 The name of Johann Baptist Georg Neruda may not immediately ring a bell, although he is not unknown. His 'trumpet concerto' in E flat - which is in fact written for a 'corno da caccia' - belongs to the standard repertoire of trumpeters. Usually his Christian name is spelled the Bohemian way: Jan Křtitel Jiří. But many musicians from that region worked in central Germany, and therefore they are also known with the German equivalent of their Christian names. It is rather peculiar that the horn/trumpet concerto is virtually the only work which is still part of the repertoire. It is one of only two solo concertos for a wind instrument. The other is the bassoon concerto recorded here. As Neruda was a violinist by profession he mostly composed for his own instrument, including ten solo concertos. In addition we know of 36 symphonies from his pen, which is an indication that he is a representative of the era between the baroque and the classical. As a person and as a musician he wasn't universally acclaimed. Neruda tried to become a member of the court orchestra in Dresden, where Johann Georg Pisendel had been the Konzertmeister since 1728. Pisendel was rather critical of Neruda, who had "drunk deeply from the Italian cup", referring to the strong Italian influence on Neruda's music. It is a curious remark: Pisendel had been in Venice and was close friends with Vivaldi, who wrote several works for him. In Pisendel's own violin concertos there is an unmistakable Italian influence as well. But Pisendel was also a product of the German violin school, in which polyphony played an important role, which is mostly absent from Neruda's music. But he also had problems with Neruda's personality, calling him an "unsociable and peculiar person". According to Pisendel he was uncommunicative and had a high opinion of himself. He had no doubts about Neruda's skills as a performer and composer, though. Neruda, in his search for employment, got in touch with Telemann who then asked Pisendel what his opinions of him were. But what Neruda really wanted was to be part of the court orchestra in Dresden. And after having written an application to the king, he was appointed violinist in the orchestra, "probably against Pisendel's will", as Kai Köpp assumes in his programme notes. In the centre of the programme is the bassoon concerto which is a nice piece of music, which gives the soloist plenty of opportunities to show his skills. In the slow movement he is expected to give a taste of his ability to ornament the solo part. Sergio Azzolini's performance leaves nothing to be desired. The concerto is performed here with single strings, and assuming this concerto was written for performance in Dresden I think a larger scoring had been more appropriate. The rest of the programme consists of four trio sonatas for two violins and b.c. They are from the only collection of trio sonatas by Neruda which was printed during his lifetime (in 1764). He wrote at least 33 trio sonatas, one of the most popular genres in Germany in his time. Although one may assume he wrote these works for his own use he also must have taken the market of amateur musicians into account as the violin parts are not overly virtuosic. They are written in the galant idiom, and the two violin parts are treated as equals. They often play in parallel thirds and sixths, and regularly imitate each other. All are in three movements, breaking away from the pattern of the sonata da chiesa with its four movements, which had been dominant in the baroque era. But only the Trio Sonata No. 6 embraces the 'modern' fashion of opening with a slow movement, followed by two fast movements. Musically these chamber works are most enjoyable to listen to. The melodic material is pleasant and nicely worked out. One could argue that this music probably needs a very good performance to really blossom, and that is what it receives here. In this repertoire the performers are expected to add ornamentation, to play the slow movements with feeling and to explore the contrasts between and within the movements. And that is what the players of Parnassi musici do quite brilliantly. The booklet contains a list of their recordings, and it shows that they have a preference for little-known repertoire. The works by Neruda certainly belong to this category. Is this music indispensable and not to be missed? No, that would be an exaggeration. But I am grateful to the musicians who have come up with this very fine disc which I have greatly enjoyed. I particularly liked the two last trio sonatas on this disc; the andante of the Trio Sonata No. 2 which is played with muted strings is very expressive. And a recording of a bassoon concerto is always welcome, in particular if it is of this quality and is performed as well as here.